With S$20m to be set aside for first-time entrepreneurs announced by Minister of State for Trade and Industry Koh Poh Koon, there is no better time to be an entrepreneur but… how would one know if one has the chops to make it? Let’s hear from Marc Dass, the first in our series of interviews on individuals with #entrepreneurialspirit as he shares his journey with ConnectOne. Marc Dass has found his mojo launching and building businesses early in his career. His first taste of new business launching was with C.Melchers Gmbh where he set up and marketed Singapore’s first two workshops converting cars to run on the alternative fuel, Compressed Natural Gas (CNG). He then went on to manage and launch a Peranakan restaurant and cafe chain across 2 central kitchens, 9 outlets generating $5.5 million turnover in 3 years. 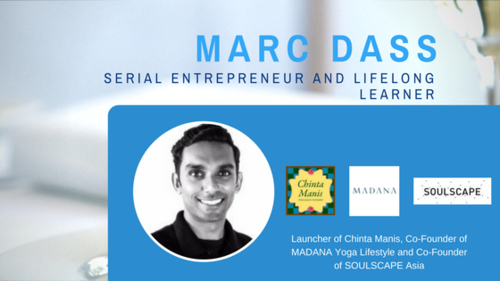 Not one to rest on his laurels, Marc went on to co-found two other startups - MADANA Yoga Lifestyle and SOULSCAPE Asia. 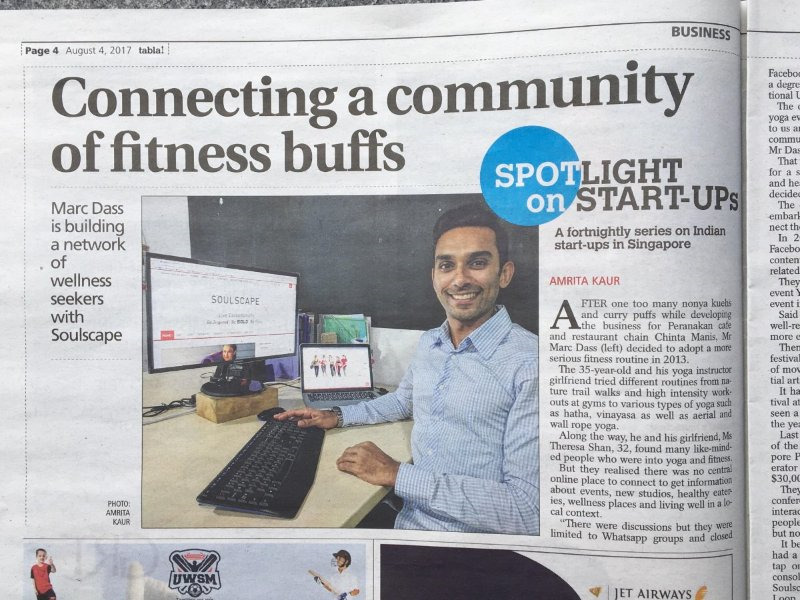 He has successfully connected over 6,000 people and garnered a reach over 2 million online viewers through SOULSCAPE Asia, Singapore’s 1st Yoga and Wellness digital magazine and festival. What made you take the leap into entrepreneurship and why F&B in the first place (referring to Chinta Manis)? I’ve always been keen on starting my own business. As a young boy, I rented out Archie’s comics in Primary school to make that extra pocket money. As for F&B, well, the opportunity came by when a family friend asked me to come on board the company and start this venture. The food scene in Singapore is integral to our culture and there was an aspect of it (Peranakan Food) which had its own community following, culture and cooking secrets. More often than not, these recipes were handed down and kept within families, found in restaurants that were more pricey and not very common. We wanted to make this accessible to everyone in a quick service format. I developed the go to market plans, led the expansion across 9 outlets and planned our first of two central kitchens. To top it all, I enjoyed being in the kitchen learning to make kuehs with our chef. It was satisfying to be crafting the cycle of going from kitchen to store! Where to start was a challenge, be it incorporating a business, getting an office, rationalising strategy and market validation. Initially, starting off and finding the rhythm and balancing the operational aspects and sales of the business was challenging. We had to streamline tasks and duties and keep abreast of how we were measuring success and importantly acknowledging our values as people and as a company. Outsourcing activities like accounting which were time-consuming, alleviated us from added business administration work allowed us to spend more time on sales and getting good staff on board. What made you co-found MADANA Yoga Lifestyle and Soulscape Asia? My partner is a yoga instructor and as she taught in several top studios and conducted classes for corporates, she was meeting with a variety of practitioners at different stages of their fitness routines. What we noticed was that as people improved and progressed in their practice they were also looking for accessories such as yoga mats to compliment their lifestyle. But what was available locally was limited in variety, material types and was expensive. So, she developed a brand, MADANA Yoga Lifestyle, that provided high-performance eco-friendly yoga products that were well priced. I came on board to help with the marketing and branding of our little venture. We now supply luxury resorts and boutique studios regionally. This was also a retail product line which complimented Soulscape as it catered to a similar target audience and we operated in the same industry segment. So, there was a potential to leverage on marketing insights and cross promotions we could run. How do you approach marketing your businesses? As a marketer, I’m still cognisant of my audience and target profiles I'm reaching out to and assessing how to best reach them. What I have learnt after marketing in a B2B and B2C environment is that the digital has to be bolstered with offline elements. Building a community and an engaged target audience needs an integrated ATL-BTL approach. In the wellness industry we’re operating in, you can see all the major players fighting to do just that. Community building, audience nurturing, understanding the customer journey and testing strategy are things I have to be mindful of how we run marketing. In a crowded marketplace, you’re going to have to find different avenues to get above the noise. Sometimes it’s not about shouting the loudest but going tactical and precise. Especially when you are a start-up! We had a more indirect competition here locally but they soon sprang up. Regionally we had more competition and we saw that as a good thing. Honestly, being a small guy in the market, we were not driven by fear of competition and saw it as a positive sign of market development. As for competing, well, we developed great experiences, focused on delivering value, good content and made sure we spoke to our clients - Business 101. As I mentioned earlier, we agreed on our values as a company early and we used that as guiding principles which we applied across such situations. If you could time travel back to day one of your business and have 15min with your former self to communicate any lessons you've acquired to save yourself from the mistakes and heartache, what would you tell yourself? All the many mistakes I made have influenced my perspectives on business, people, society and life. Most importantly, it has shaped my character. So even though painful, I wouldn’t change the heartache. It has made me stronger and I believe it prepared me for the future. I still tell myself the same thing when I started; Set objectives, Plan carefully, Execute relentlessly - Enjoy the journey.